Aron Ralston (Franco) is an intelligent guy. At Carnegie Mellon University, he was a member of Phi Beta Kappa and Tau Beta Phi. Now while I don’t really know what that is, I do know that his job as a mechanical engineer at Intel was a pretty good one. He gave that up to climb mountains in Colorado…during the winter. He loves his life and he loves this planet. While he and I would never be in the same circle but by luck, I can admire his zeal. 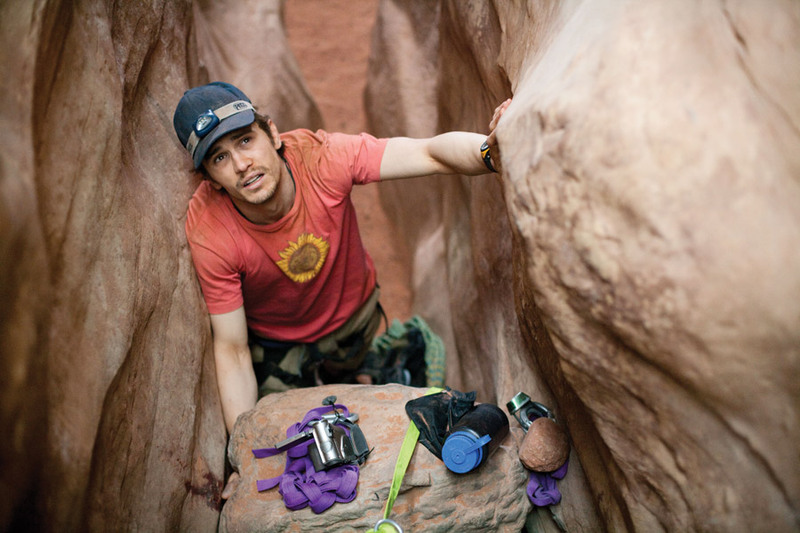 When Ralston decided on a whim to go hiking across Utah’s Blue John Canyon, taking a bike, 2 bottles of Gatorade, a container of water and a cheap knife, he did not think at all about the possibility of needing to let anyone know where he was. This decision would nearly cost him everything, Nearly. 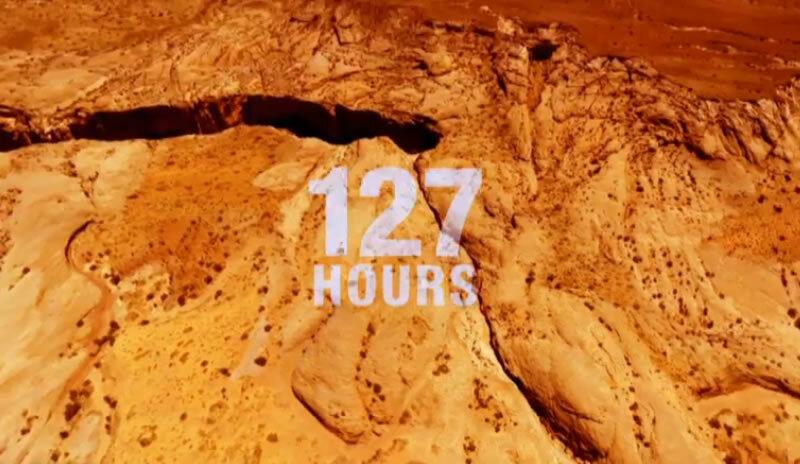 The details are fast and furious at the start of 127 Hours. If you pay attention, these mini foreshadows casts a pall that belies the movies’ soundtrack and the look of joy on his face. He listens to a voice mail being left by his mom, feels no need to interrupt by answering the phone. This is one of many calls, it seems, he has heard and not bothered responding to. A pang of recognition for the viewer who has done this to loved ones in their own life. Taking tomorrow for granted. Even the smartest of us can do this. red earth. Unaffected, he rolls on towards the next stage. That experience is a bit softer than before, as he encounters two girls believing they are lost and shows them an absolutely wonderful place. They have fun, and plan to have more fun later, back in the city. Life is good. Ralston is on a roll. Then it happens. A mixture of arrogance in his physical prowess, difficult terrain, and a loose rock makes for a precarious fall. He seems to be alright, with one hand banged up pinned between the rock and the rock wall. Nothing else too bad. He begins to move the rock…or so he thinks. The rock, it appears, is not going to be going anywhere. It’s at this moment Danny Boyle flashes the title on the screen. It’s a fairly effective maneuver, as one realizes that if the clock starts here, Ralston has a tougher road ahead of him than originally thought. What follows is an acting and directing masterpiece. 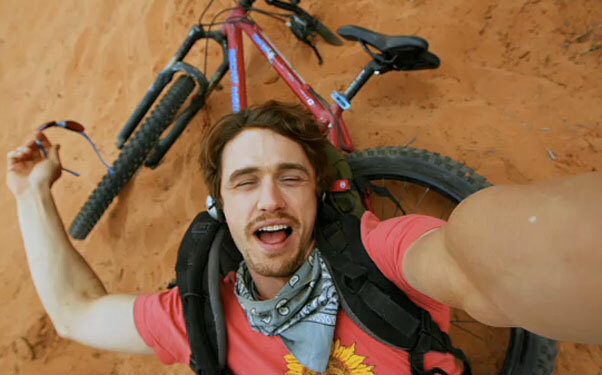 Franco and Boyle take the viewer on a sympathetic, almost spiritual discovery of life and near death. Something for every possibility, except a good knife. interactions with others, though brief and through flash back, show the depth of introspection one would not expect from such a physical man. Half expecting to see a version of Robert Conrad in the role, the soft-spoken and enthusiastic Franco was just the right person to play Ralston. Boyle, for his part, almost presents the movie camera as another person. Using every device possible to get the most out of each scene (especially those pertaining to water), he ramrods through the movie, even while giving a real sense of proportionality to the desperate long hours that took place. The scenery, even from within the ravine trap he in which he is stuck, is fantastic. It never did occur to me that the sun could hit any spot out there for such a short period per day. Perhaps the most jarring scene in the film is played perfectly. As anyone who even hasn’t seen the movie knows, Ralston lost his arm. The moments that is taking place is so well filmed with music and quick camera angles, I can feel it now, even as of this writing. All of this takes place, though, after Aron Ralston’s inward journey. His epiphany, drawn out over several days, is a moment in time that he connects to the universe in a way that most of us, walking around, could never do. It reminds me of a Lou Reed line from a song, “The Sword of Damocles” from one of his best works, Magic and Loss. 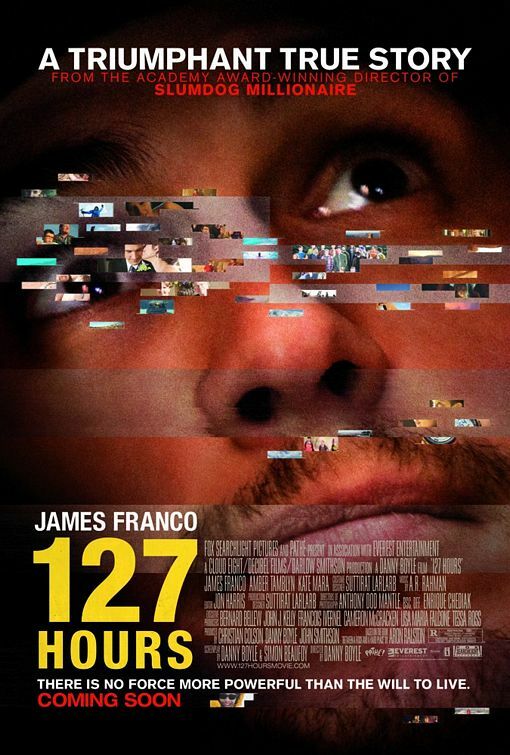 See this movie if you want to appreciate your life a little more.